WHEN: Saturday, April 20th, 9 a.m. to 1 p.m.
WHERE: Washington Park Arboretum, 2300 Arboretum Drive East, Seattle, WA 98112. (#43 or #48 bus to 24th Ave East at Lynn Street.) Meet at Crabapple Meadow, just south of the Graham Visitors Center. WHAT: Volunteers will restore the Arboretum through spreading mulch, removing invasive weeds, and maintaining trails. BRING WITH YOU: Please wear long pants and closed-toe shoes, preferably work boots or sturdy sneakers, and bring a reusable water bottle. The event will take place rain or shine, so please dress appropriately for the weather! PROVIDED: Coffee and snacks will be provided for all volunteers, as well as project materials and gloves. KID FRIENDLY: Volunteers of all ages are welcome! For young children, we will have a work area close to the check-in station at Crabapple Meadow, where they will be able to have fun pulling weeds such as ivy and buttercups and/or mulching (under the supervision of their care givers). FREE LIGHT LUNCH: Stick around and enjoy a free light lunch on Crabapple Meadow, courtesy of the SCA. Questions? 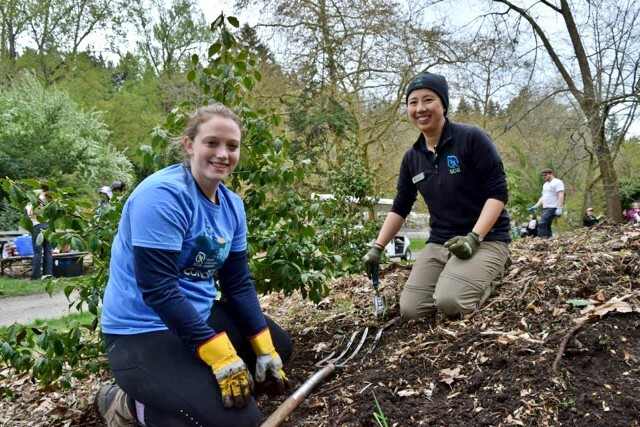 Contact our Volunteer Programs Manager Alyssa Henry at 206-325-4510 or ahenry@arboretumfoundation.org. Thanks to our generous event sponsor for providing coffee and snacks to the volunteers!